I’m not going to lie to you, a raw ox cheek does not scream eat me. When Nicola (my local butcher from Red Bank Farm) heaved an immense globule of fatty, car tyre from its display lair, I was tempted to suggest she lever it back into place. I’ve had pigs cheeks before, they were dainty ‘ovalettes’ of tender, meaty goodness, a stark contract to the wad of flesh that an ox chews it’s cud against. 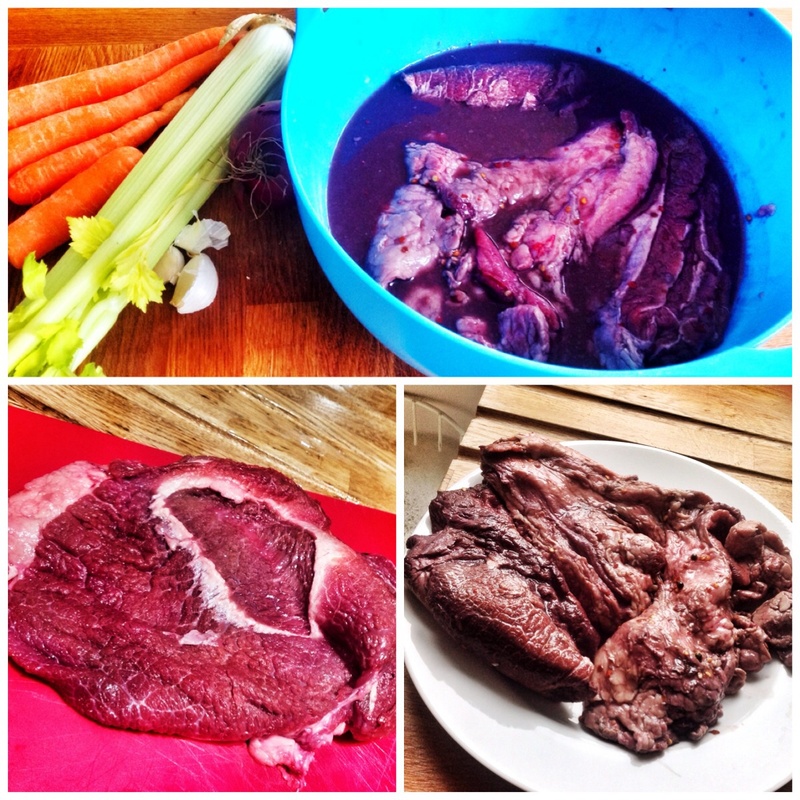 However, a strange curiosity made me keep up with the scheme and so a Sunday tea of ‘braised ox cheek’ was born. A recipe was found courtesy of James Ramsden, foodie writer. I skirt through his method with my added pics and words. Hopefully they merely embellish an already glorious wordage. As many meat lovers may already know, fatty when slow cooked for a long time becomes spectacularly gelatinous, and (in James’s words) extraordinarily handsome. I do urge you to do this. The results are extraordinary. 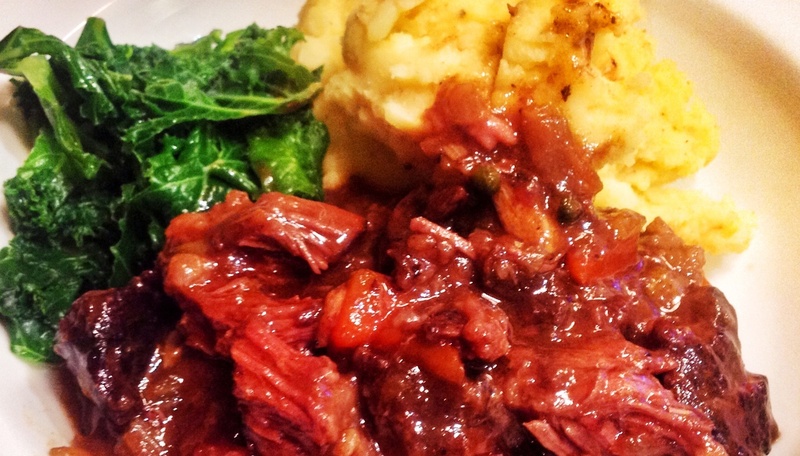 Ox cheek is wonderfully flavoursome, perfect for a winters eve. About 15 minutes prep is all that’s needed. The oven does the rest. It can be done a day or two ahead if you like – the flavour will only improve – I served with greens and mustard mashed potato. Preheat the oven to 160C. Remove cheeks from marinade and pat thoroughly dry. Heat a drop of oil (if using olive don’t use your best) in a frying pan over a strong flame and brown the cheeks thoroughly, seasoning with salt and pepper as you go. Transfer to a large saucepan. I ended up using my beloved ‘Le Crueset’ roasting tin. Lower the heat in the frying pan. Add the butter and melt, then add the vegetables and a good pinch of salt and pepper. Soften for a few minutes then add to the pan with the ox cheeks. Tip the marinade into the frying pan along with the stock and bring to a simmer, scraping any sticky bits off the pan. Tip this into the saucepan, cover, and transfer to the oven. Cook for 3-4 hours until tender. 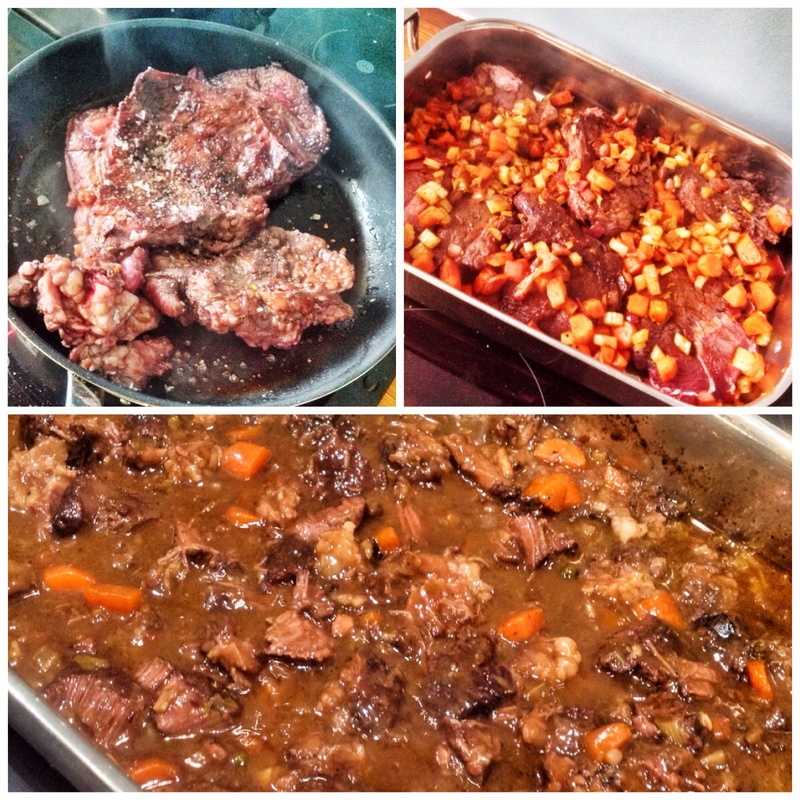 Remove the cheeks from the braising liquor and rest in a bowl. Put the saucepan over a generous heat, add the tomato puree, and simmer to reduce by about a half. Meanwhile shred the cheeks with a couple of forks. Return to the pan and stir through the reduced broth. Keep warm until ready to serve, or cool and refrigerate until whenever. I promise it will be spectacular!